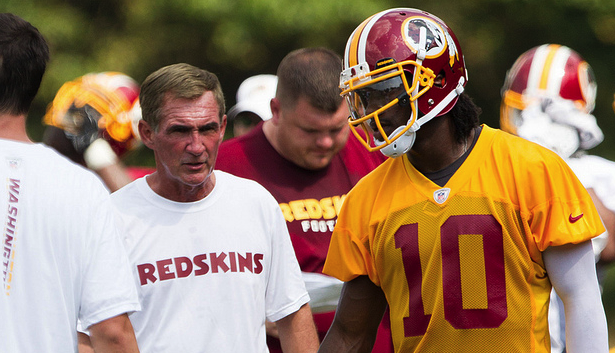 A liberal Washington Post columnist wrote about football star Robert Griffin III’s injury on Sunday. He ended up saying a whole lot more. At first I shrugged off this analysis as a top columnist venturing out of his comfort zone to discuss a topic that had all of Washington buzzing, and falling flat. But Robinson’s analysis actually reveals more than the liberal lion intended. It may say little about how RGIII was hurt, but it says so much about the Washington consensus liberalism that Robinson so ably represents. There was a time when progressives, as a point of principle, made an effort to side with the people against the tyrannical and corrupt. The best of Bob Herbert, Jimmy Breslin or Molly Ivins always makes clear that the fish rots from the head and that the Beltway wisdom that “you get the government you deserve” served only to shield those in positions of power. But times have changed. Now, if you criticize President Barack Obama, if you say that armed drones and kill-lists shouldn’t be part of US foreign policy, or that a negotiated austerity is nothing to cheer, or criticize anyone but Republicans, twenty-first-century liberals like Robinson see their role as blaming you for hobbling the president, weakening his hand and making the situation worse. This shift of liberalism’s focus is seen so clearly in Robinson’s analysis of what happened to RGIII last Sunday. Robinson writes that the transcendent rookie was injured because “it is the fans—in the stands and in front of their television sets—who have made football our national sport. Risk and injury are not just a part of the game, they are at its heart.” This analysis might seem to make sense to some on the face of it, but it’s really just hot air that actually obscures the role that powerful people played in making RGIII’s injury an inevitability. The quality of the natural grass turf claimed not only RGIII but also Seahawks pass rushing specialist Chris Clemons, who tore his ACL and is now out of action indefinitely. The conditions at FedEx Field have been an issue for years, with Minnesota Vikings superstar Adrian Peterson tearing every ligament in his knee last season on the same turf. The league should have long ago sanctioned Dan Snyder for putting players at risk. Now, his penny-pinching has jeopardized the face and future of the franchise. If nothing else, this nationally televised OSHA violation should have been front and center in Eugene Robinson’s column, but neither the field nor Snyder are even mentioned. Even worse, USA Today is reporting that Mike Shanahan has openly misrepresented what team orthopedist Dr. James Andrews said to him about RGIII’s knee. As they reported, “Andrews insisted he never cleared Griffin to return to a game in which Griffin initially injured his knee, even though coach Mike Shanahan again tried to lay the responsibility on him.” If this is true, then Mike Shanahan should never work in the NFL again. If it’s true, it’s also a horrific example of a person in authority abusing their power. Once again, this is something Eugene Robinson could have discussed. Instead, just as Shanahan passed the buck to RGIII, Robinson passed the buck onto us. Yes, football is a game unsafe at any speed. Yes, it’s governed by a toxic macho ethos that makes injuries like we saw Sunday inevitable. But there are real flesh-and-blood people we can hold to account for what took place. There was a time when we could count on liberals with a public platform to be a part of this fight. That era is starting to look as outdated as calling a team the “Redskins” or as much past its prime as a certain 60-year-old coach. If there is going to be a real fight against power and privilege, not just in sports but in politics, it might be time to champion some new fighters. For more on powerful men getting off the hook for harmful decisions, read Dave Zirin’s post on NCAA football runners-up Notre Dame.